I recommended scarves and bandanas as one of the essential accessories I think every person looking to get into these styles should consider obtaining. But what can you actually do with them? How can you use scarves to enhance your style? Shocking, I know (yes, that picture is my poor attempt at comedy). Perhaps you shouldn’t combine it with a plaid shirt but if worn with a nice blouse and a blazer, it can add that small touch of retro elegance to a work outfit without violating any dresscode. Seriously though, I’m going to assume you know that scarves can do this and that they can be tied in different ways. One tip is if you have a thin scarf and are wearing a collared shirt, wear it under your collar. Flip your collar up like a douchebag bro, tie the scarf around your neck, then flip the collar down to avoid looking like an idiot. 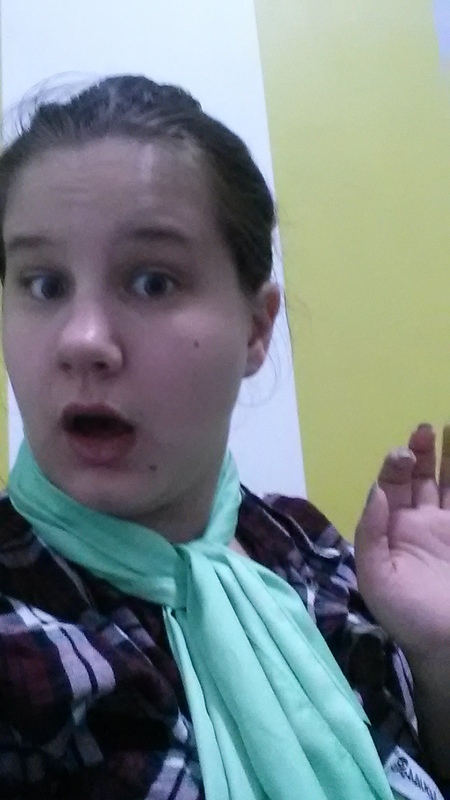 The scarf I’m using for this series of photos is a mint green scarf from Sourpuss. It’s silky and set me back about 16 dollars. 2. Covering the majority of your hair. So this is really simple, you just fold it in half or until it’s the size you want. If you’re paying attention to what you’re doing you can easily avoid having a seam stretching across your entire head. Yeah, check the mirror before you leave to see if you’ve made any mistakes like this. Just position it on top of your head and tie it at the back of your neck. I’m wearing my hair up in this photo. 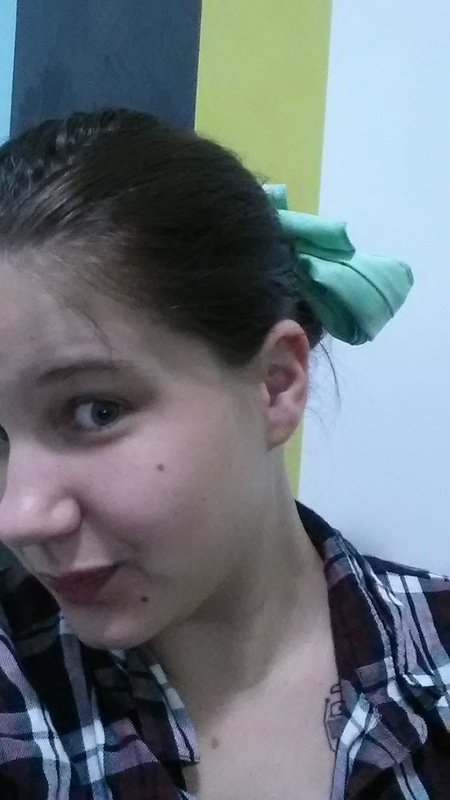 If you need to secure the scarf, use bobby pins to pin it to your hair. This style obviously works to cover greasy hair or just really keep your hair out of your face. If you want, tuck the ends of the scarves in under the knot and secure with bobby pins. Because the scarf is so thin you won’t get overheated even in warm weather. As we’re stepping through these pictures, take note of how my skin tone/colour changes depending on the light. Not for any particular reason, but just because the contrast is quite astounding. 3. Pretending to be a headband. So this is a very similar style to the last one, the only real difference is the width of the scarf and that I’ve decided to tie it into a bow instead of a double knot. Not much else to say except that this is a more stylish variation of style number 2 that still serves to add some flare to regular hair styles like a pony tail. To the right is the same style shown with my hair down. After getting the scarf in place, just remove your hair tie. 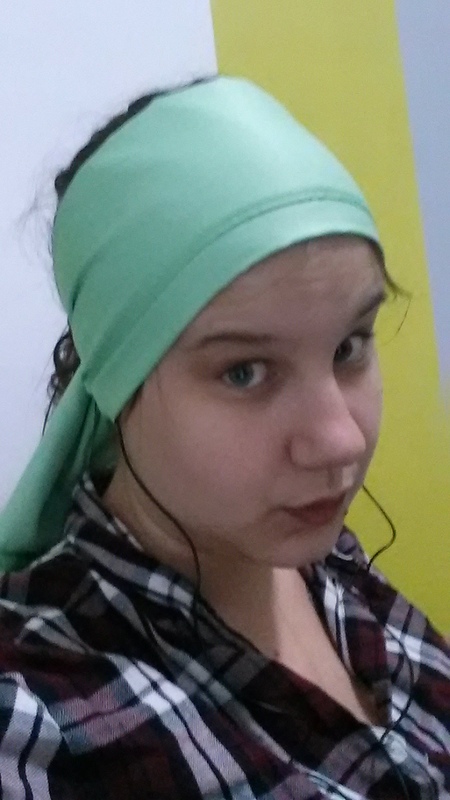 Again, it’s a good style to cover your hair if you don’t have time for a shower that morning. If you wish to make it more extravagant, you can always attach a hair flower to the side or off the centre off the scarf. For this, I’m wearing my hair in a bun. Just do a regular casual bun or pony tail. Then take the scarf (folded to be thin) and wrap it upwards. Tie a regular knot on top and then a bow. This is a good way to wear a scarf in your hair if you like me have very slippery hair. If you wear a pony tail and use a light blue scarf, you’ll look a lot like Belle from Beauty and the beast and that’s always a bonus. This is the one style that I can guarantee won’t give you any trouble or have the ends of the scarf get in your way. Practical and pretty. Not shown here because it wouldn’t look good with a button up shirt, but it you’re wearing a strapless dress or a tank top, consider wrapping a long scarf around your shoulders fairly tightly. Let the ends meet on the front of your chest and pin them together with a brooch. This is a nice way to cover up if you have a dress that’s almost right for the occasion except that it shows a bit too much cleavage or if you want to cover your arms.